Watson Laboratories, a subsidiary of Watson Pharmaceuticals, has won FDA approval for its abbreviated new drug application (ANDA) for Budesonide inhalation suspension 0.25mg/2mL and 0.5mg/2mL unit-dose ampoules. Budesonide Inhalation Suspension is the generic equivalent to AstraZeneca's Pulmicort RESPULES, a maintenance medicine used to control and prevent asthma symptoms in children ages 12 months to eight years. 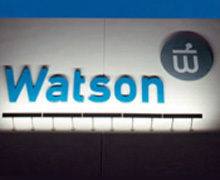 Watson considers launching the product in 2012 subject to obtaining a favorable outcome on an anticipated motion for a preliminary injunction in the pending litigation with AstraZeneca concerning the product. Pulmicort RESPULES had total US sales of approximately $1.1bn according to IMS Health data, for the twelve months ending 31 May 2012.